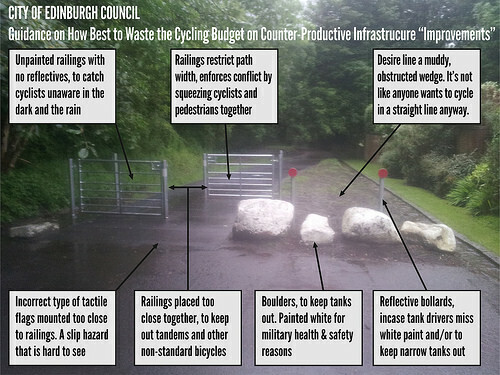 Public funds squandered making vital cycle route less safe? In the north-west of Edinburgh a short stretch of tarmac links the city centre with West Lothian and Fife, converting tens of thousands of car journeys from the gridlocked A90 to virtually car-free bike commutes. Just twenty minutes hard riding will take you from the edge of Edinburgh at Cramond Brig Toll to Haymarket, or down to Leith – without ever suffering from the city’s dodgy drivers. Then the rot started to set in. Within days, trenches were dug across the path and half-buried bricks put in, to prevent cyclists getting too comfortable. Giant slow signs have been painted everywhere for the benefit of occasional dog walkers, putting them in a strong bargaining position when Fenton is allowed to hospitalise a hapless commuter. Finally, a chicane has been put in at the top of the path along with the city’s favourite “tramline” tactile paving (naturally no space has been allowed for cyclists to negotiate the paving before the chicane, they’re right next to each other). Apparently this has been done because “we are under a lot of pressure from residents there to tackle excess speeding from cyclists”, according to a council source. (Strava reveals that the 85th percentile cycling speed is under 20mph and the official Stats19 data shows there were no injuries, even slight ones, to any pedestrian or cyclist in the ten years from 2000-2010, but hey ho). Take a look at the video. Is that really what residents wanted? Couldn’t they have enjoyed walking along a path that’s twice as wide where cyclists start off on the opposite side? Ironically the far side of the path (I didn’t bother uploading the whole video) is considerably narrower as houses have been built hard up to the tarmac, with typical lack of foresight. There the council has installed speed tables because residents’ driveways preclude chicanes. The moral would appear to be that it’s OK to drive at 20mph but cycling at that speed is reckless, optimistically ignoring the fact that 95% of the people cycling through *are* drivers who’ve given up the cut-and-thrust of Edinburgh’s roads. (While you wouldn’t drive on such a path, after you remove oncoming traffic and parked cars from the width of Edinburgh’s actual roads the space you’re left with to drive in is not dissimilar). I don’t pretend to offer any kind of solution to the odd nutter on a bike, other than pointing out that we should be using the available space to make wide paths when it’s so easy to do so. Unfortunately so long as the only alternative route is a multi-lane road where traffic is either completely stationary or belting along at 40-50mph, a lot of commuters are going to switch to an attractive empty cycle path, and every so often one of them will annoy a pedestrian. It’s still better than putting them back in their car. I don’t agree that 20mph on a bike and in a car are the same from a pedestrian’s point of view. If the car and pedestrian are in the same roadway (like on the stretch of road down to Cramond Bridge), I would expect the pedestrian to be very unhappy at a car going by at 20mph. It’s different if you’re segregated by a kerb. Equally, a bike going past my elbow at 20mph while I’m walking is likely to get a “too fast!” shout at their disappearing rear. I commute to work by bike on a shared path and moderate my speed to something unscary. Many cyclists however seem to go past pedestrians too fast and too close. I agree with all the rest of what you say though! The kinetic energy difference (if hit) between a car and a bicycle going at 20mph is huge. That path (and entry gate) looks big enough to create a segregated cycle/pedestrian path instead of these banal shared paths that Sustrans is so keen on creating and so introducing unnecessary conflict. No one wants to be hit by anything at 20mph. And even without actual collision, it’s scary having a bike passing you at 20mph – and I know that very few pedestrians and cyclists have been killed in collisions, but I bet that it has happened at 20mph or lower, or life-changing injuries suffered. I normally cycle to work but needed to walk the route on Tuesday this week instead (NEPN) and although I kept far to the left and did my best to be a predictable pedestrian, I was mildly freaked by the number of cyclists who came by too fast and too close. This was on a flat bit – if it had been a hill like the path in question above, they could potentially have been going much faster. I wanted to walk along with my arms stretched wide to remind people how much space they should give a pedestrian. Yes I know it’s a commuting route and pedestrians need to be aware of that, but too many of them were treating it like a road and not giving other path users the respect or space they deserved. Chill, guys! Stop trying for KoM! Segregated is much better if there is space (and I agree there should be). I’m often in two minds about this sort of thing. At the end of the day I think I draw a distinction between having a responsibility to be safe, but not necessarily to make other people *happy* (although naturally this will often coincide). When it comes to my own riding, I hope that I am always safe, but I think it’s fair to say that I’m not overly bothered about trying to make pedestrians happy at my own inconvenience (here I concede that their interpretation of safety is relevant and that everyone has their own definition of inconvenience). Critically, I don’t expect drivers or pedestrians to make me happy at their inconvenience either, I merely require that they don’t endanger me. Perhaps trying to equate acceptability across modes is a flawed model but I haven’t come up with anything better (I generally suppose I’m driving a small silent car). I think part of the issue for me is that we’re in a transitional state with no established boundaries. If 20mph is not acceptable, is 10mph acceptable even if the pedestrian you’re passing wants you to go slower than that? If not, where do you stop? When you don’t ride at all because the natural preference of pedestrians is to have a space which isn’t multi-modal and everyone drives instead? If on the other hand we decide 10mph (or whatever) is OK even if they don’t like it, doesn’t that just indicate that we’re taking our own preference as a pedestrian and projecting it? Personally I have no problem with people passing me on bikes at 20mph, although when I use NEPN I do walk on the right (Highway Code style) so that I see everyone approaching me. I guess it’s natural that a speed I find OK as a pedestrian seems OK when riding? I am sure I’ve seen proposed somewhere a rule of thumb about how far away is “comfortable” for passing traffic (either cars overtaking bikes or bikes overtaking peds). Something like 1′ per 5mph of difference in speed (or perhaps it’s 1m for every 10mph) – the numbers aren’t actually important at the moment, what I mean is that there is a big difference between a 20mph cyclist passing inches from my elbow (as was happening on Tuesday when I walked=me being shouty “too close!”), or giving me a wide berth at the same speed (not distressing at all). Livia, I think you’re completely right – except perhaps for the dogs…but I may gave a higher standard of ‘under control’ than some. For most people -ie not Dave – perception of safety /subjective safety does matter. Sarah, I did specifically say that perception of safety was important… my point was more that as agents we have a strong responsibility to *be* safe but perhaps not the same responsibility for the perception of safety. There are things you can do which are unsafe that do not cause alarm – using those silly old steel rims where you can’t actually slow down should a pedestrian step in front of you. The problem with the perception of danger is that it is, well, subjective. As a driver, I only overtake cyclists when I would be happy to be overtaken if I were cycling. However, I’m sure there are some cyclists who are comfortable with closer overtakes than I am and some who are not comfortable. I’m not sure there can be a definitive answer beyond ensuring that there is no objective danger. How does this relate to shared paths? Well, I think there’s a clear responsibility not to endanger people who you are passing (on foot or other cyclists) and I think if you are so close that someone can’t side-step a “doggy gift” or pile of broken glass without a crash ensuing then we’re not talking about a perception of danger any more. Some pedestrians will be uncomfortable with a cyclist passing them at all, while others seem to be quite inured (or oblivious) to anything – perhaps in the same way that a new cyclist is put off by many roads that experienced cyclists are quite comfortable with? Whoever you are and however you cycle, you’re just picking a position on the spectrum, there aren’t any “good” cyclists who don’t cause a perception of danger at all. Dave this goes way back to our original discussions many years ago now about cyclists on the links versus trying to walk there with toddlers. We didn’t agree then, and we won’t agree now. Although I am happy to revisits if/when you have kids (or borrow some – along the lines of your ‘cycle like a granny’ experiment. I’m currently cycling while unwell, so not able to go fast/accelerate out if danger. Not fun. In the same way that cycling is statistically safer than a life of inactivity, but the fear of traffic restricts the number of cyclists on the roads, I think that we should also be aware that pedestrians fear us when we’re cycling on shared paths. Personally, and especially when coming up behind pedestrians, I tend to ensure my approach and passing speed is never more than a couple of mph faster than the pedestrian, and this speed adjustment must be in place before the cyclist can be heard coming up behind. Just scrubbing off speed at the last second simply isn’t good enough. 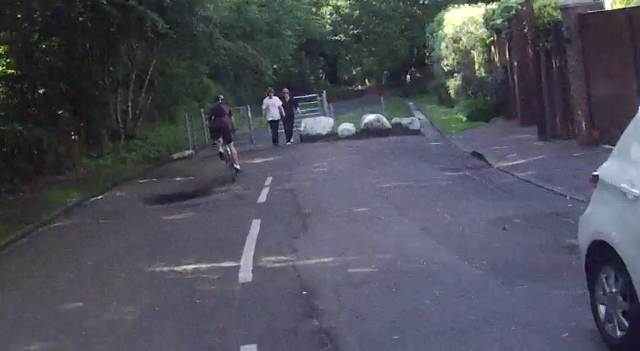 Even as a cyclist, there are certain shared paths local to me that ought to have a bike ban, such is the extraordinary arrogance of a surprisingly large number of riders who cycle without regard to other users. The important thing to remember is that if pedestrians feel uncomfortable with our approach and passing speed on a shared path, then it is indeed too fast. No ifs, no buts, no Strava. Nick, your perspective is a good example of the asymmetry we see (almost only) in the UK. That it can be held by so many cyclists is a sad inditement of how far we have to go before we can claim to be a legitimate transport method. It might sound a bit like I’m trying to claim that people should be able to cycle however they choose, but I’m not. The point is that according to social norms, pedestrians might find *any* cycling speed faster than a dismount to be uncomfortable, making it impossible for any segregated cycleway to be morally “right” no matter how people ride. I argue that reasonable cycling is OK even if pedestrians are uncomfortable, because if it is truly reasonable, then pedestrians will (have to) acclimatise to it. Perhaps that’s a workable definition of what is OK and what is not – if it would not be OK with peds in the Netherlands, it’s not OK here either? There’s a great comment by Janez on my Road without pavement (or pavement without road)? post which I recommend to you. Dave, Janez provides a great insight into the realities of path use in The Netherlands. In fact, I’m actually in favour of allowing (low speed) cycling on pavements. But there’s a danger that “acclimatisation” could be seen by many cyclists to carry on ignoring common courtesy. It’s wrong, in my opinion, to expect pedestrians to accept potential conflict. Cyclists on the road, are generally more experienced, are arguably more likely to be “acclimatised” to the speed and proximity of passing traffic (which can more easily be heard approaching from behind) and the convention of travelling on the left of the road almost eliminates the uncertainty experienced on shared paths where it isn’t clear which side you are going to be passed until the very last second. But crucially, cyclists have the option of taking another route, using another form of transport, adjusting their speed, or “taking the lane”, options not so easily available to walkers, or indeed slower (or less confident) cyclists. Unless we’re careful, the aggressive and often inconsiderate behaviour shown by an alarmingly large percentage of cyclists, to the detriment of other shared path users, is hardly going to help our cause. The message should not ever be for pedestrians to “acclimatise”; we should be slowing down, be ready to stop (or even dismount) and, above all, remember that one close encounter (when shared on social media) has the power to launch a thousand punishment passes and a hundred objections to any improvements to cycling infrastructure. “On a shared path there is no rule about where pedestrians can and can’t be” – well maybe. I’d suggest that Highway Code Rule 2 (which includes walk-on-the-right) still applies to most no-motor-traffic roads like shared paths, but of course pedestrians can be anywhere and ultimately take priority, the same as on the roads in general. Everyone should keep their eyes open, keep things moving if possible and it’s nice to be nice. The heart of the matter is people of all strips are often unintentionally inconsiderate and too often we lack a sense of personal responsibility. In Canada (I have also ridden across the UK and rode through Edinburgh) we have the same problem. As a long time cyclist (competitive, recreational and advocate) I understand the desire to keep ones pace when riding. That said, as a father and pedestrian I literally want to smack cyclists that blow by my small children and I within inches while on a shared path. This endangers my children to no fault of their own. I have had cyclists literally clip us on the sidewalk (pavement in UK parlance), because the cycling route had construction on it and nearly run us over on a pedestrian crossing because they didn’t want to stop (or even slow down) for a stop sign. When this happens I get the same overwhelming feeling of vulnerability as I get when brushed by a car on a shared roadway. As cyclists we should know better about vulnerable road users, but I fear many only consider their own vulnerability without any consideration for others. I used to think the world would be a better place if more people started cycling instead of driving. Now that it is starting to happen (e.g., Vancouver) I suddenly realized this was a fantasy and that the same inconsiderate behaviour I once saw on the motorways has simply materialized on the bikeways as we get a larger cross-section of people and behaviours. It is just people being people (often times selfish and inconsiderate). – Realized a shared path is just that, shared. If you are training and need to keep a constant pace then find a more appropriate route, a shared path is simply not the place. – Use a bell or give a friendly call when approaching a pedestrian to let them know you will be passing. Be considerate about this as it can be startling if you wait to the last second. – Pass with a safe distance at all times and slow down to a safe speed when passing. If conditions do not permit a safe pass then, slow down and wait. Basically, treat pedestrians exactly the same way we want motorists to treat us shared care/bike road ways. Crazy, huh? – Give extra space and consideration when passing children and pets, despite best efforts of their handlers their behaviour can still at times be random. It is unfortunately often a reality of their nature. – Walk predictably and chose a side of the path! Yes, you likely live near by, but this doesn’t give you ownership of a public path. – Keep in control of your dog or child while using shared paths. If you want to let them run free, this is not the place. – If you are walking in a group do not take up the entire path, again “shared” is the important term. – If you choose a shared path, don’t bemoan the fact it is a shared path (some personal responsibility please). If a silent walk without cyclists is your priority, then choose the appropriate location. The problem is that we are quick to point out the flaws in others without considering our own transgressions. I am most certainly not perfect in this regards, but I do try on a daily basis to give consideration to others. I would only pick up on “I used to think the world would be a better place if more people started cycling instead of driving…” to ask whether you don’t agree that there still many great reasons for modal change, other than the expectation that people have a personality transplant when they buy a bike (which I agree is a fantasy). Just to pick two things at random – there’s a big fuss here at the moment as 1/3 of the adult population is now pre-diabetic, and also over the quality of the air which falls far below legal requirements. In both cases even if you ignore the direct health implications there is a serious cost attached – each taxpayer is hit for an average of almost £2,000 to pay for the NHS (and we hear that 10% of that is paying for diabetes alone), while cities are being fined over air quality (which in turn is a local taxation cost). There’s absolutely no reason to expect better behaviour from people when they swap car for bike, but IMO we should not compound that by creating situations that encourage bad behaviour, especially when it would be so easy in many cases to put in infrastructure that helps people rub along. 2. “Pass with a safe distance [else] wait”. If I waited for a safe distance to be possible, I’d be waiting all day because most UK shared routes just aren’t wide enough for a safe distance. That’s another sort of manufactured conflict between walking and cycling and a reason to be very sceptical of shared-use routes alongside roads. @Dave – As this is a cycling blog I unfortunately took for granted that we are all behind modal change being positive (preaching to the choir so to speak). I would like to officially state my support for cycling as a mode of transportation! I just wanted to make the point that as an activity becomes more mainstream (again in the case of cycling) we get a deeper cross section of people and behaviours. Warts and all! 1) I personally found an early warning ding followed by a double ding when within the 10 m seems to work well. If I still get no response, I usually voice a friendly “on your left,” as a last ditch effort. (Recall that we ride on the proper side of the road in Canada). 2 m seems too close to me. 2) For your second point, I feel I must question your motive. If it is not safe to pass, but you do anyway (e.g, because it is congested), it really is your decision to endanger others for your personal gain. Is it possible to modify your route to avoid the offending paths? As a personal aside, I don’t mind tacking on 5-10 extra minutes for a smoother route with less congestion (pedestrian, vehicle, horse drawn carriage, etc) and find it odd that many other commuting cyclists do not share this perspective. I do not know your perspective, just a thought I wanted to throw out there to the world. One of the problems that seems to present itself here is that the paths are in extremely high demand because there is an absence of real alternatives. For instance, in the case referred to above, the only real option is to ride along this… it’s not even a question of taking extra time, since it would doubtless be quicker to ride along the direct dual carriageway route, but you can understand that when people have a choice between giving up cycling and annoying the odd ped, they will be inclined to choose the latter. There are many more paths like this in Edinburgh – too narrow and too popular to be truly good routes, but essential because the alternative option is non-cycling. The NEPN paths on my direct commute are so congested with other cyclists that I am constantly held up, just as if I was driving on the road (although of course, still infinitely preferable). I’ll need to post some footage of that! @Rider X – 1) I agree and do that (although just “excuse me” because I’ve had people mishear “on your left” as “to your left” and walk across) but just pointing out it doesn’t always work and riders end up blamed for the failure to share when really tried; 2) I don’t mean it’s congested – I mean many of our paths are too narrow to pass anyone at that sort of safe distance. I’m in a rural area a long way south of Edinburgh and my alternatives are not-great singletrack country lanes which take 45 minutes instead of 20, or a certainty of riding 2½ miles at 15-20mph in front of motor traffic on a road with an average traffic speed of 39mph – it’s a 40mph limit so that means lots go faster illegally – they were catching nearly 100 a day breaking a 30mph roadworks limit. So I take the possibility of conflicting with another path user (cycle flows are fairly tidal and few people walk next to that nasty traffic) as the least bad option and all the time think bad thoughts about the terrible designers who have manufactured this conflict. I stumbled across this looking at your excellent reference for recumbents (of which I am thinking of trying). I recently trundled down to Edinburgh from Fife on a tandem and couldn’t believe the cycle path you reference here. Lovely path but shocking entrances at both ends. I managed to steer the tandem through the gate pictured but only just and only because there was no one about. In fact on both passes of this route we didn’t meet any one, which was probably a good thing. I was using the path to avoid climbing over Drumbrae or Clermiston. Whilst decidedly easier on the legs (and my stoker) I’m not sure that it was much safer other than the fact we were lucky we met nothing. I’m not usually prone to rant, and hadn’t realised the pictured gate was new, but whoever though this was a good idea needs their head looked at. On the other hand I’ve been on both side of the pedestrian and cyclist debate (and indeed the driver/cyclist one too). Usually it is a case of “playing nice”. The only sensible choice is separation but without the land it’s hard to see where that comes from. they havent a scooby what they should be doing.why dont they hop on a plane to holland to ask the dutch how to come up with sensible cycling planning???? ?